Intel's upcoming Atom tablet chip code-named Bay Trail will be repurposed for use in the company's Celeron and Pentium chips for entry-level laptops, desktops and all-in-ones, Intel said on Friday. Intel's Bay Trail chip is based on the Atom architecture, which is in low-power smartphones, tablets and netbooks. 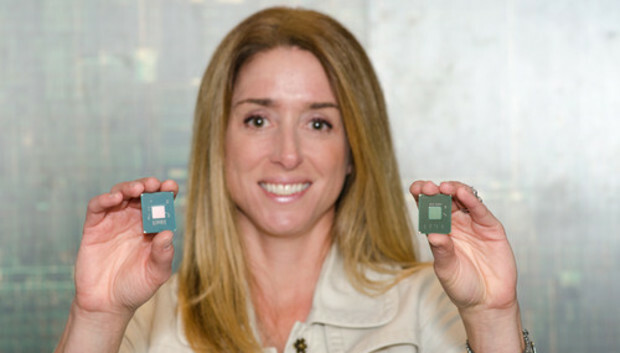 Beyond the tablet chip, Intel will release Bay Trail-M (mobile) and Bay Trail-D (desktop) parts, which will be available under the Celeron and Pentium brands, Intel spokeswoman Kathy Gill said in an e-mail. Pentium and Celeron chips are used in low-cost PCs, and the move represents an architectural shift for those brands. It also represents Intel's wider reliance on Atom architecture for entry-level computing. Bay Trail is based on the Silvermont architecture, which Intel claims will be up to three times faster and five times more power efficient than older Atom cores. Silvermont will now power Intel Inside devices including entry-level PCs, tablets, smartphones and low-power servers. Intel is using Silvermont in its upcoming smartphone chips code-named Merrifield, which are due to ship early next year. Intel previously announced it would use Bay Trail in PCs, but did not announce branding for the new chips. "Because of the advancements and flexibility of the ... Silvermont microarchitecture, we can customize the Bay Trail feature sets and develop variants of Bay Trail that will power a new crop of computing products at a variety of price points," Gill said. Intel is expected to share more details about Bay Trail chips at the Computex trade show in Taipei next week. The company could show Bay Trail tablets running Windows or Android at the trade show. PCs and tablets with Bay Trail are expected to be released later this year. The inexpensive Pentium and Celeron chips have been based on the same architecture used in the company's faster Core chips, but with fewer features. The most recent Pentium and Celeron chips were based on Intel's Ivy Bridge architecture. At Computex Intel will announce new Core chips based on the Haswell microarchitecture, but it remains to be seen whether Pentium or Celeron chips will be based on that chip design. "We have Celeron and Pentium products today based on our Ivy Bridge microarchitecture; we aren't ready to disclose additional details on Haswell plans at this time," Gill said. Customers reacted negatively when Intel rebranded its PC chips in 2009 to Core i3, i5 and i7. Intel released its first Pentium chip, running at 66MHz, in 1993, and the first Celeron chip running, at 300MHz, in 1998. Since then, PCs with those chips have sold well, and Pentium remains a brand name buyers identify with. The chips compete with AMD's low-end chips such as the A4, A6, Sempron and Athlon. "The goal is to offer our customers the broadest selection of form factors, features and experiences at a range of price points," Gill said.